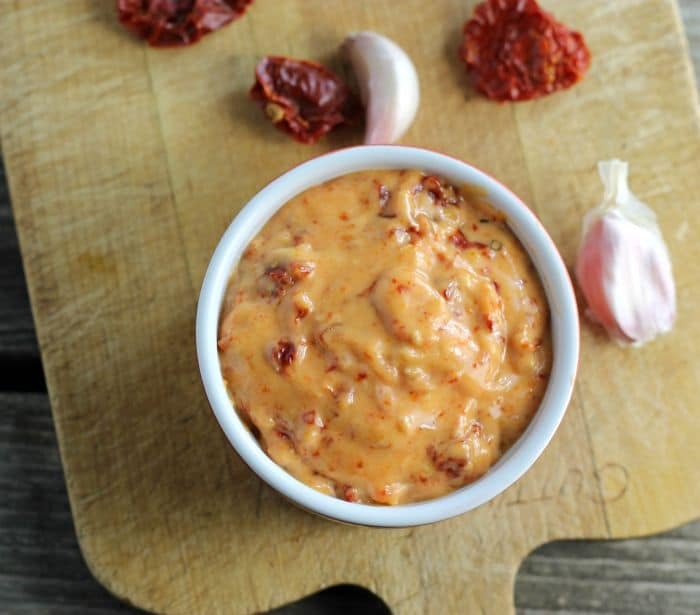 Sun-dried tomato aioli is so simple to make, you can spread it on sandwiches or use it as a dip. 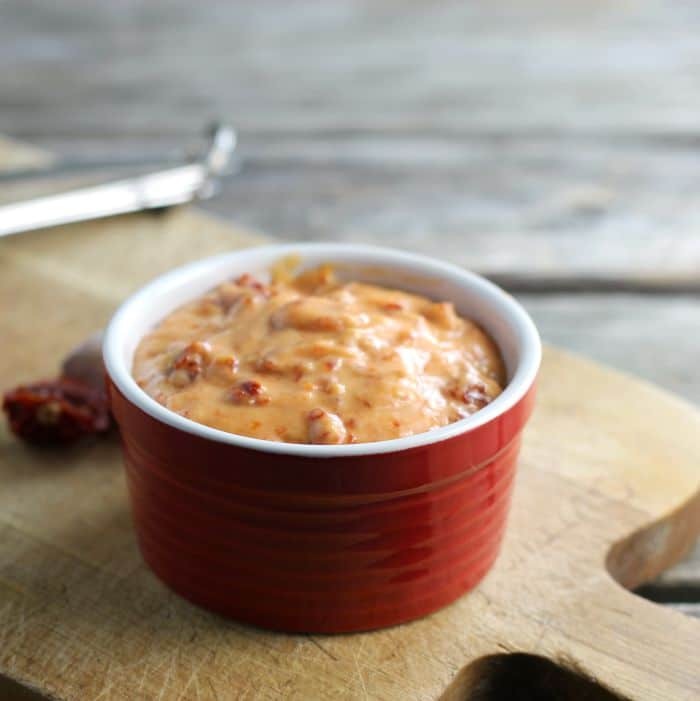 Sun-dried tomato aioli is a blend of mayo, sun-dried tomato, garlic, lemon juice, olive oil. I just recently had my first taste of aioli while eating out. It was a garlic aioli on a blackened chicken sandwich. It was delicious, and I have been waiting for a chance to try my hand at making aioli at home. It is always a treat for me to go out to eat and every time we go out I tell myself that I am going to try something new. I love eating fish and that is what I usually end up ordering. One of the last times we went out to eat I saw this blacken chicken sandwich with aioli sauce and I actually order it. I was so proud of myself. I know that aioli can be made with raw eggs, but I went with a mayonnaise base. Raw eggs scare me, I thought it would be safer with the mayonnaise, and it was easy to work with. This aioli takes only minutes to make. All you need to do is place the ingredients in a food processor (I used a mini food processor) and it is done in a matter of minutes. It is so easy to make and so delicious. So far we have had it on chicken, once on a chicken wrap and then on a chicken sandwiches. The sun-dried tomato aioli was perfect for the wrap and on the sandwich. You know what; I bet it would be great with fish too. I chopped my sun-dried tomatoes and cloves of garlic before adding them to the food processor. I am not sure if that is necessary. 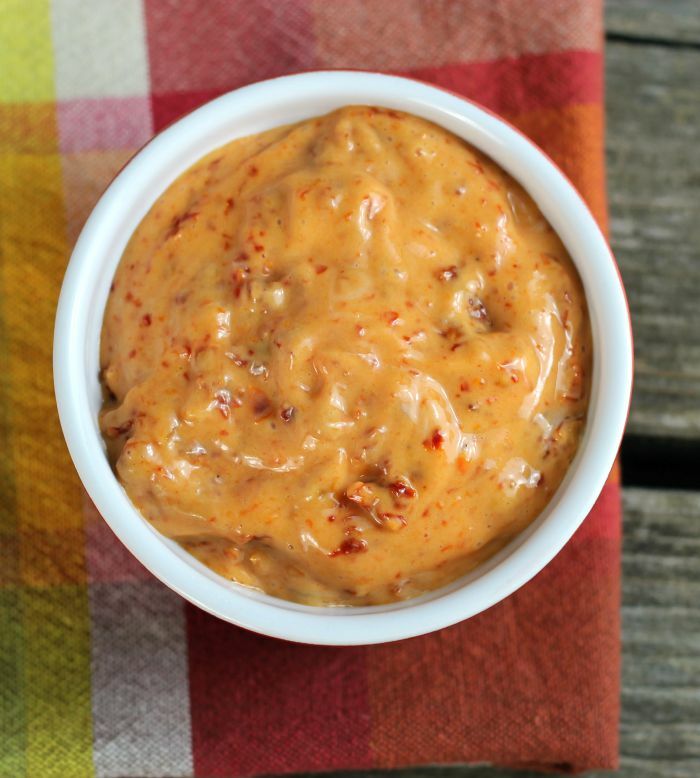 You mentioned a chicken sandwich and now I’m dreaming of one with a generous smear of sun-dried tomato aioli! Delish!! YUM! The spread would be fantastic to use in salads too. …or just eat it with a spoon! 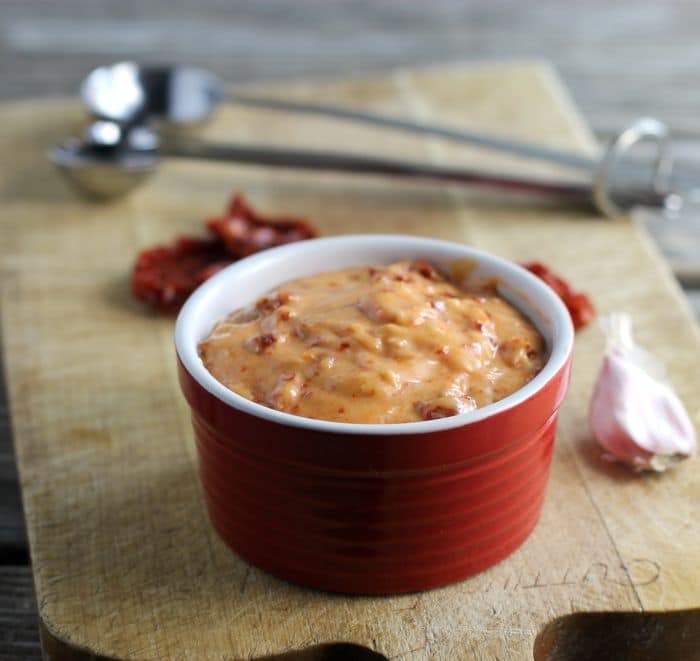 This aioli looks fantastic!